Your retirement years always are better off financially when you have truly passive income, which is income that comes in with absolutely no effort required on your own. Common forms of passive income include Social Security, pensions, 401(k) plans, annuities, and others. In virtually all such cases, after you make your initial investment, you do nothing other than collect regular income from your investments. And while many view real estate as more of a hands-on, active investment requiring effort and focus, it is possible to obtain passive income from real estate investments during your retirement years. An active real estate investment is one in which you buy a property and actively repair, maintain, lease, and administer it. You don’t have to do all of them to actively own real estate. Simply taking the time to research and buy rental properties makes it an active investment. A passive real estate investment, however, is one in which you simply invest a sum of money that others use to buy, repair, maintain, lease, and administer real estate properties to generate income. As a passive investor, you earn a portion of the monthly revenues as passive real estate income, and that is all you are required to do – ever – for as long as the investment exists. If the property is sold, you also receive a portion of the proceeds relative to your investment in the property that was sold. All the while, you have no concerns or worries, other than collecting your regular income. The benefits of passive real estate investments are many and, frankly, wonderful when the investment works. You have the freedom to do whatever you choose to do without concern for your investment. You can travel and enjoy a relatively leisurely retirement secure in the knowledge that you have regular income coming from your real estate investments. If you have chosen your investments well, they are made in secure, stable markets in which you can count on receiving essentially the same amount each time you are due to be paid rather than concern yourself about market fluctuations and reduce income. And if you have sudden financial emergencies, such as hospitalization costs or repairs to be done on your home, that passive income will help to cover your costs and keep you and your family financially secure throughout your retirement years. 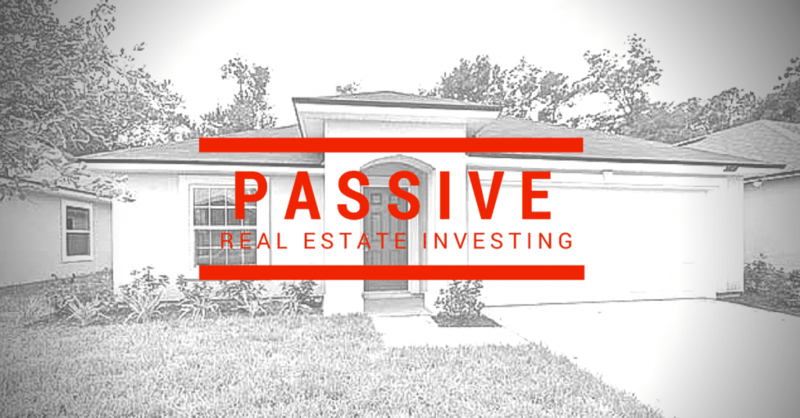 When it comes to passive real estate investing, you typically will need to invest in large commercial properties, such as apartment communities and commercial developments, or turnkey residential properties to obtain passive real estate income. Relatively small investments, like buying single-family homes and small apartment units, often are done with traditional bank financing or cash and by only one person or a very small group. Because the investment is small, they don’t need outside capital investments. But when it comes to large apartment communities worth millions of dollars, buyers and operators often times need investors to help them secure the large properties and management contracts. Instead of dealing with a lengthy, slow, and labor-intensive bank review of records to obtain funding, it’s much easier for investment groups to obtain outside capital from people like you who are looking to invest in real estate and do nothing else beyond collecting income. Turnkey real estate provides the opportunity to build wealth from property equity as well as monthly cash flow. Many choose to purchase multiple turnkey properties to increase monthly cash flow and earn consistent passive income for retirement. Turnkey properties are a passive way to invest in real estate as the home purchase, renovations and property management are all handled by experienced teams. The investor simply buys the properties and collects their monthly rental income checks. You can invest in passive real estate by researching real estate markets that offer high rents and lower property values. Find an experienced, reputable company to partner with who invests in stable markets with growth potential. When done properly, your passive real estate income will prove highly beneficial and rewarding and could last throughout your retirement. Talk to one of our investment specialists to learn how JWB can help you earn passive income through real estate investing.